Are your children into stacking, building and creating? Do you have a LEGO fan on your hands? 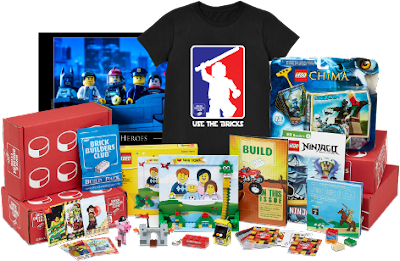 I'd like to introduce you to BrickSwag, the LEGO subscription box designed specifically for kids! How cool is that? My children were so excited when their first ever BrickSwag box arrived! BrickSwag is a box full of LEGO-themed merchandise that is delivered straight to your house! Every box of BrickSwag contains an exclusive t-shirt, genuine LEGO's for your children to enjoy and keep, Funky Figs Trading Cards, a Build Magazine and so much more! LEGO's are so much fun for any age, the possibilities are endless when it comes to building and creating! With Novembers BrickSwag your children can build a LEGO turkey, learn about a Cornucopia, and even check out the specks on a Mini Cooper! It's easy to get started with BrickSwag, simply choose your membership option. They have a monthly plan, as well as a 3, 6, and one year plan to chose from. Once your plan is selected, simply fill out the payment and shipping information - then wait for your box of fun to arrive! So what do you think? BrickSwag is a must have for LEGO lovers everywhere this holiday season! What a cool gift to give! Be sure to stay connected with BrickSwag on Facebook! Use code Fam20 online at BrickSwag to save 20%!